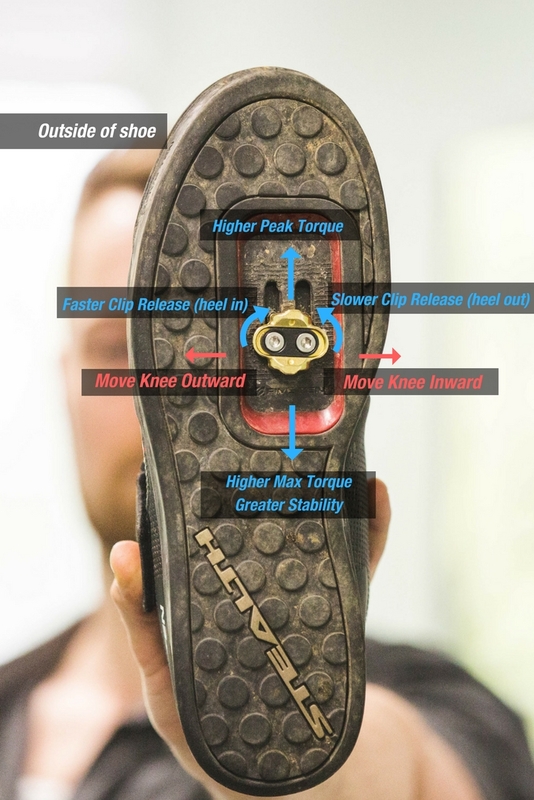 There are a lot more considerations that go into a professional bike shoe fit than you might realize. While we always recommend getting your bike professionally fitted (through your local LTP Sports dealer, of course), it’s sometimes useful to understand the basics so you can take care of initial setup and minor changes yourself. This guide will explain the basics of cleat fit, and show you how position changes will affect the ride on your mountain bike. What makes MTB cleat position different? There is significant literature available on road cleat positioning. Most, if not all, pro road teams have a professional fitter on retainer for such adjustments. Mountain bike cleat fitting follows many of the principles that you’ll find available through sites like stevehoggbikefitting and bikeradar. There are some important differences, however. These can be broken down into three categories: Frequency and speed of unclipping, torque/power output, and ride position on the bike. Unlike road riders, who unclip only a few times per ride, and often in a pre-planned and controlled fashion, mountain bikers are faced with the need to unclip instantly when trail conditions change and the bike starts to slide. Thus, mountain bikers need to be able to unclip and re-clip faster than road riders. Setting up cleats to allow easier and faster clipping and releasing is an important consideration when setting up MTB shoes. Due to the technical nature of most mountain bike climbs(and descents) when torque is applied to the pedals, it is usually for shorter periods of time, but at much higher wattages. To accelerate the bike up and over a root ball while on a climbing trail takes as much torque as sprinting to the finish line in a road race, but in a very short burst (and likely several times per ride). Thus the ability to bring high torque to bear quickly can affect how easy a technical climb feels, or whether an extremely technical climb is possible at all. When mountain biking, significantly more of your time is spent standing than on a road bike, and the force applied to your feet is more significant (especially for aggressive riders who experience increased force upon takeoff/landing jumps). There are three axes to cleat adjustment, fore/aft, lateral, and torsional. Fore and aft is the position of the cleat toward the toe or heel of the shoe (where the cleat is positioned in the tracks, and dictated by the shoes design). Lateral adjustment is built into the cleat, and refers to how far side to side (inside of the foot to outside of the foot) the cleat can be set up. Torsional adjustment is the angle at which the cleat is locked down compared to the plane of the cleat tracks. Torsional adjustment affects cleat float and how quickly the cleat disengages with the pedal. Fore and Aft is determined according to rider preference. Much like fitting road cleats, it is a good idea to start the cleat just behind the third metatarsal of each foot (the knuckle inside your foot where your middle toe starts). This positions the cleat under the ball of your foot. Moving the cleat forward will increase the lever effect of your foot and ankle. The foot is an inherently inefficient lever, and so this requires a considerable amount of effort from the calf to stabilize the foot in this position. The Pro’s are that you can develop slightly more peak torque with your cleats farther forward, and you’re likely to develop sweet shredded calves from all the extra exertion needed to keep your foot stable. Most mountain riders will move their cleats farther back on the shoe (some preferring as far back as the shoe will allow). The lower leg then becomes a connecting rod, not a stabilizer. The benefits of this position are increased stability, less energy expenditure to keep the foot stable, (reducing fatigue on long rides and speeding up recovery), higher torque through a greater range of the pedal stroke, and a lower possibility of extreme ankle flexion on hard landings. A rearward cleat position usually requires a lower seat height, and can lead to increased toe-overlap on very small frames with steep head tube angles and large wheels. Lateral adjustment is based on your physiology, and should be determined by a professional bike fit. The crux of the issue is that when seated and pedalling, your pelvis, knees and feet should be in a straight line. Cleats too far outboard on the shoe can move the shoes in too far toward the frame, and cause the riders knees to bow out, and the opposite can cause the knees to drop in. Knee pain and cleat position are intimately linked, so if you’re experiencing knee pain when riding, see a professional! Torsional adjustment affects the engagement point of the cleats. All mountain cleats have a certain amount of float built into them (float is the amount that a cleat can twist before engaging the pedal release mechanism). If you assume that your cleats have 6 degrees of float (as Crank Brothers cleats have), a base setup would allow your foot three degrees of movement either direction without engaging with the pedal. Determine your starting setup by standing on the bike (in your shoes) without the cleats installed (if possible). Observe how your feet naturally want to sit on the pedals, and set the cleats up so that you can comfortably stand clipped-in in this position. By rotating the front of the cleat toward the big toe of the shoe you will make them disengage sooner than normal, and rotating the front of the cleat towards the small toe of the shoe will mean more movement is necessary before the cleats disengage. And there you have it; cleat setup in a nutshell. A couple of last points: It’s a good idea to keep your cleats free of dirt and grime, and ensure that your cleat bolts are secured with blue lock-tite. Your local Live to Play Sports dealer can hook you up with a sweet pair of Crank Brothers pedals, and help you set up the cleats to ensure your rides are more comfortable and more confidence-inspiring!